FTER THE BEATLES IS A MIND BLOWING EXPERIENCE! All of the huge hits from the solo years of John, Paul, George, and Ringo played by what looks and sounds like The Beatles themselves! 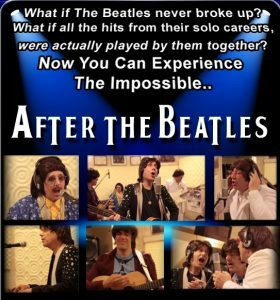 This Amazing Beatles Tribute Band takes the Beatles experience a step further where no other tribute show has gone. This is an alternate universe where The Beatles never broke up!